Effective July 1, 2002, the U.S. Postal Service expanded its highly popular Delivery Confirmation and Signature Confirmation services to include First-Class Mail parcels. Converting from traditional options for tracking and confirmation to this new First-Class Mail service, results in huge savings for both the retail and commercial uses. Heres how it works: To qualify, your First-Class Mail must go as a parcelnot as an envelope. By using a rigid parcel instead of an envelope, postal rate savings can be as much as $2 or more per piece, including the package cost! Take advantage of new USPO regulations by using ConfirMailer. confirMailers are made of lightweight recycled boxboard/corrugated to maximize the 13-ounce weight limitation of the new regulation. Self Seal Closure on both ends of the box with a tear strip opener. Knocks down flat for easy storage. Easy set up. 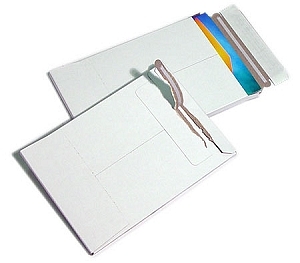 confirMailers come in four sizes to accommodate a variety of uses. Minimum 37% recycled content, with 21% post-consumer waste. Custom printing available. Click here for details.